Google Doodles, playful illustrations that mark holidays and anniversaries on the search engine's home page, have celebrated the birthdays of Vincent Van Gogh, Louis Braille, and "Sesame Street." At Google's Silicon Valley corporate headquarters, the artists painting on digital canvases are producing works of art that will be viewed by millions . . . but disappear in just 24 hours. They are the creators of Google's Doodles, the often playful illustrations that regularly transform Google's home page to mark things like holidays . . . famous birthdays . . . and notable discoveries and inventions. If you happened to visit Google any time yesterday, you saw a celebration of the 20th anniversary of the launch of the Hubble space telescope. "Just doing a little rough sketch where things are going to go, and hope that the engineers at NASA do not check this for authenticity," said Micheal Lopez, who was creating the Hubble Doodle the day we visited Google. "Space will be back here, and the Earth horizon behind it, so you can get the sense that it's doing its orbits around the Earth," he said. "One quick, little brushstroke. I think that's good." Lopez leads the team of Google Doodle designers, four artists whose work is seen not only on Google's American website, but on Google home pages for more than 100 countries around the world. Ryan Germick was creating the Doodle that appeared on Google's British website Friday - St. George's Day, honoring the dragon-slaying knight. "St. George's day is important," Germich said. "My father's name is George. So, you know, that's a little special personal interest to me." Jennifer Hom is working on a Doodle for Google's Czech website. "It's the birthday of Komensky; he was an educator in the Czech Republic," she said. Susie Sahim is creating a doodle for the Google home page in Spain for the birthday of a renowned naturalist. "His name is Felix Rodriguez de la Fuente," Sahim said. "So the sun is creating the O. And the two wolves together make the G. And his body much more vertical, making the L."
The doodlers take their art seriously. Jennifer Hom said Rembrandt, Caravaggio and Van Dyke were good reference points for the style used in their Doodles. From emulating the masters to imitating cartoons, Sahim says the Doodlers do it all. "We could do acrylic, we could do, you know, oil pastel," Sahim said. "There's all kinds of possibilities out there." "You can make this logo look like it's been made out of anything," Blackstone said. "Yeah, pretty much," said Sahim. During this year's winter Olympics, Google Doodles recognized a different event every day. And when "Sesame Street" turned 40 last year, Muppets moved onto Google home pages around the world. The doodlers come up with ideas in casual pitch meetings, largely based on the calendar and what's going on in the world, looking for ideas they call "Googley" - art, science and technology, steering clear of anything too commercial or political. Google Doodles have become an online art extravaganza, but the first doodle, put up by company founders Larry Page and Sergey Brin in 1998, was much simpler - a tribute to the Burning Man Festival. Dennis Hwang, one of the earliest Google workers, was a student intern when Page and Brin noticed he could draw and suggested he dress up the logo. "For the first six or seven years, I was pretty much the only one creating these designs," he said. "My first one was for Bastille Day, I think in year 2000," he said. "And I remember nervously putting up what I think of now as a very, very rudimentary, simple design." In those days Doodles appeared only occasionally. Hwang was doing something that in many companies would be forbidden: Altering the logo. "The first rule is leave the company identity alone, keep it consistent," Hwang said. "You look at Coca-Cola or McDonalds or Starbucks, anywhere in the world, and the symbols you see are very consistent." But Hwang kept playing with Google's logo, even as it was becoming more famous. "Larry and Sergey like to challenge conventional wisdom," Hwang said, "so they asked the question: 'Hey, why not have fun with our company branding and logo?'" Of course, sometimes the logo doesn't seem to "say" Google at all, like one marking the invention of the bar code, and only those who know Braille could read what the Doodle marking Louis Braille's birthday said. "I think one of the things we try to do is make sure that you can actually see the Google logo, every single time," said Germick. "I know there's been some concepts that I've done where, you know, these guys are scratching their heads, going, 'Where does it say Google?'" In the annual competition "Doodle 4 Google," kids are invited to submit their own Doodles, with $15,000 awarded for a college scholarship fund. "But I think the biggest thing of all, that's really exciting for the kids, is the fact that they get their Doodle put on our home page for hundreds of millions of people to see," said Lopez. One Doodler laughed, "I saw some 'Doodle 4 Google' winners, and I was, like, Wow, I need to step up my game!" The Doodles seem to be getting more ambitious all the time, using animation for Sir Isaac Newton's birthday this year. And for Halloween, Ryan Germick created a Doodle that was a trick . . . as well as a treat. "If you clicked on it, then the whole logo became candy," he said. "And then, if you clicked on it again, there was just a big, huge pile of candy. You couldn't see the logo anymore. "And if you clicked on it another time, it was just wrappers, you know?" 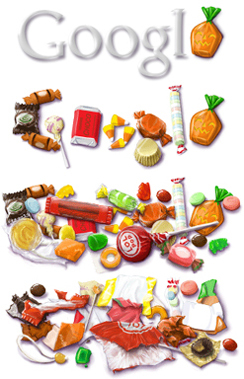 The Doodles make opening Google's homepage a little like unwrapping candy . . . there may be a surprise inside. This year's winning "Doodle 4 Google" design will be featured on Google's homepage on May 27, 2010.